Domang Yangthang Rinpoche (Tib. མདོ་མང་གཡང་ཐང་རིན་པོ་ཆེ་, Wyl. mdo mang g.yang thang rin po che) or Kunzang Jikme Dechen Ösal Dorje (1930–2016) was a renowned Nyingma teacher from the region of Yangthang who was associated with Domang Monastery, a branch of Palyul in Eastern Tibet. Rinpoche was born on the tenth day of the eleventh month of the Earth Snake year (i.e., 10 January 1930) in Yangthang in western Sikkim. His father, Pema Drodül, was from Dzogchen in East Tibet and his mother was Tenzin Chödrön, the daughter of Yangthang Ating from the family of Oyuk Drakar. At an early age, following miraculous indications, he was recognized as one of the two incarnations of Tertön Dorje Dechen Lingpa of Domang Monastery in East Tibet, himself an incarnation of Lhatsün Namkha Jikmé. In 1942 he travelled to Domang Monastery, where he began his studies there with Domang Soktrul Rinpoche, the principal disciple of his previous incarnation. He also received teachings from Dzakha Lama Tsulo, who was a khenpo at Domang, and from Palyul Khenpo Kunzang Özer, Rahor Dzogtrul Rinpoche, and Washul Kuchen Thupten Chökyi Wangchuk. In 1959, when the Communist Chinese invaded Tibet, Rinpoche left Domang, but was later captured and imprisoned for twenty-two years. After his eventual release in 1981, he returned to Domang to find his monastery completely dismantled. He then obtained permission to return to Sikkim, where he remained thereafter. Following his return to Sikkim he received a number of important teachings and transmissions from Dilgo Khyentse Rinpoche, Dodrupchen Rinpoche and Penor Rinpoche. 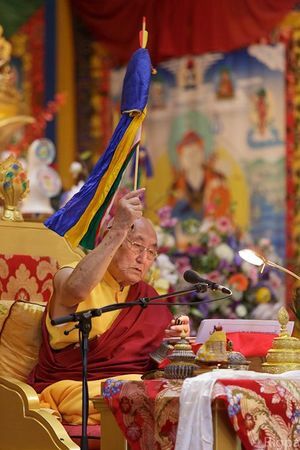 In the winter of 2010–2011 he bestowed the entire Rinchen Terdzö in California at the invitation of Gyatrul Rinpoche. He passed into parinirvana in Hyderabad on 15 October 2016. 28 July 2012, Lerab Ling, France: Rigdzin Düpa empowerment & Rigdzin Düpa Tsedrup, long life empowerment—during Rigpa's annual Ngöndro Retreat. 2-9 August 2012, Lerab Ling, France: cycle of Longchen Nyingtik empowerments, see Empowerments Given to the Rigpa Sangha for more details—during Rigpa's annual Dzogchen Retreat. This page was last edited on 3 April 2017, at 15:56.